I have a portfolio of suppliers. How do I manage risk across this with all my managers? In order to keep a view across your whole portfolio, you must measure how the portfolio delivers as a “unit”. Set your Portfolio Strategy: KPIs for Cost, Quality, Time. Communicate the combined Portfolio Performance from a Risk Perspective. Too often, a Supplier Portfolio runs as a series of supplier “Silos” connected by contractual SLAs and hand-over points. This often leads to silo’d risk management, which can manifest as an issue at a portfolio level. To avoid issues at a portfolio level, performance must be measured and summarised together to ensure the entire Supply Portfolio is self-aware. KPIs for Cost, Quality, Time. Again, nothing new here,… but the difference comes in #3.. This must be done simply, and regularly, so that the whole Portfolio can monitor it. Update regularly and broadcast it. This Supplier Risk and Performance Dashboard template allows you to identify, present and manage the risk and performance of your Supplier portfolio. >> view details. 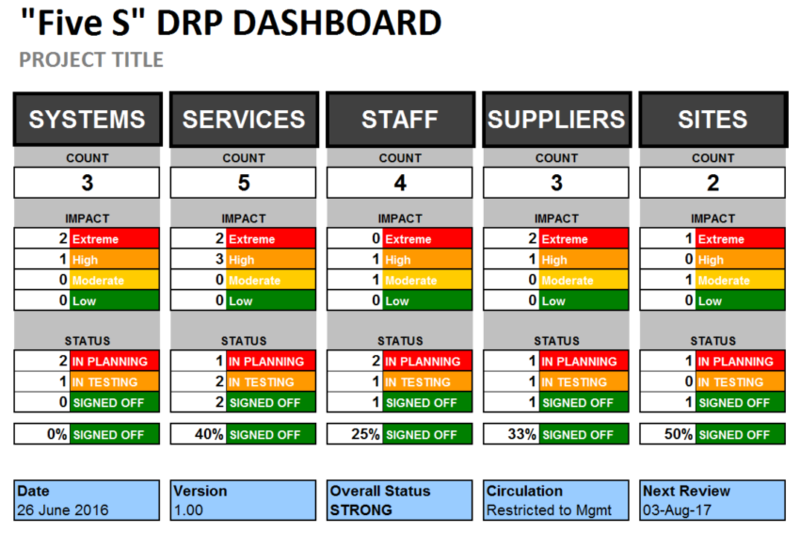 This Excel Disaster Recovery Plan Dashboard Template combines a list of your Disaster Mitigation Plan line items with a striking Impact & Status Dashboard. >> view details. A dynamic supplier control template which has status indicators automatically updated by performance data. >> view details. This Risk Log template supports a Solution-focused Risk Management strategy by combining a powerful Risk Dashboard with Mitigation Data. Show HOW and WHEN your risks will be mitigated, and WHO owns them. >> view details. Graphically rich with automatic editing features, this slide deck conveys a companies annual business performance in a highly professional way. >> view details. This Mobile Friendly Dashboard is specifically designed to be viewed on a mobile, and for social media sharing. Communicate present supplier performance to your teams, stakeholders and executives while they work on the move. >> view details. To manage your supply chain, you need to segment suppliers accordingly so that your resources and efforts are spent in the right place. This template enables you to do this and has a detailed list of supplier activities required to effectively manage your supply chain. >> view details. How do I run procurement and select suppliers? How do I manage risk using a RAID Log? Answer Count: 1 When was the question asked? 2016/05/16 11:02:01 AM By Business Documents UK Ltd Team .